A Hopper like no other. This is your chance to ride little known dirt roads in remote Mendocino County. 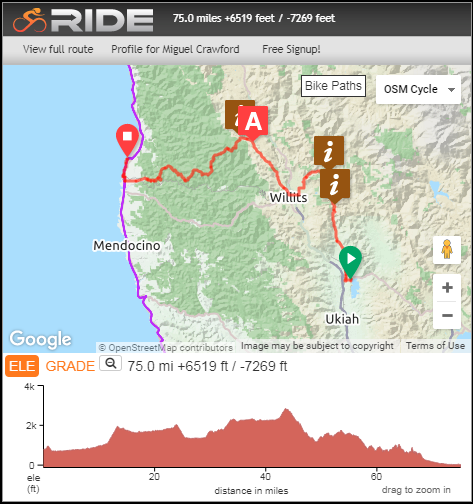 Over 25 years of riding and exploring in Northern California has led to the crazy combination of pav, dirt and gravel roads that make up this two-day cycling adventure. Day 1 begins at 9:30 AM as we briefly climb up from Lake Mendocino and descend to Eastside Rd and roll through Redwood Valley before hitting our first climb of the day, Tomki Rd. At mile 13.7 the road turns to gravel and crosses Tomki Creek 8 times before hitting the pavement again at mile 17.5. From here you continue north and then west back to Willits on a mix of pavement and gravel. There will be a quick stop to grab a bottle or top off at mile 28.5 for those in need. Otherwise, the main feed zone is at mile 39. Mile 29 is the intersection of Downtown Willits and we head west on Sherwood Rd. The second climb of the day is good to fair pavement and climbs from 1350 ft to 2820 ft. Our NorCal Bike Sport feed zone will be at mile 39. Sherwood Rd turns to dirt at mile 41.5 and rolls along the ridge and descends to our finish at mile 64.5. That’s over 20 miles of dirt! From here riders will roll to Fort Bragg and McKerricher campground where cold beer from WoodFour Brewing Company, a hot shower and tasty food provided by SAG Monkey awaits you. Day 1 includes 35+ miles of dirt/gravel.